1. The economic recovery is largely bypassing low- and middle-income workers, whose wages remain well below what they were before the Great Recession, the Sacramento Business Journal$ reports, citing a new study from the California Budget Project (via Rough & Tumble): “The median hourly wage for a low-income worker in 2013 was $10.90, more than 5 percent below the inflation-adjusted, pre-recession level. The median wage for middle-income people, $19.10 an hour, is also just over 5 percent lower than the pre-recession level.” Wages for higher-income earners, by contrast, have returned to pre-crash levels. 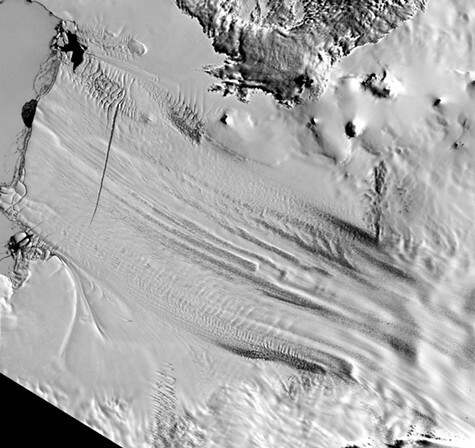 The West Antarctic ice sheet is melting faster than expected. 2. A massive ice sheet on the west side of Antarctica is melting more rapidly than climate scientists had thought and has crossed a tipping point in which the melting cannot stop, The New York Times$ reports, citing two new scientific studies. Once the ice sheet melts into the ocean, sea levels will rise by up to twelve feet worldwide. The melting is likely being caused by a combination of human activities: climate change from burning fossil fuels and a hole in the atmospheric ozone layer. 3. PG&E has fallen behind schedule in its efforts to upgrade and repair gas lines throughout the Bay Area, and likely will not finish until 2015, the Trib$ reports. 4. California’s new computerized testing for K-12 schools has been plagued by numerous glitches, resulting in many students being unable to take the standardized tests, the LA Times$ reports. California switched to computerized testing this year, and the tests do not yet count. 5. Alameda County has quietly implemented a steep pricing plan for court records downloaded from the internet — and is now charging fifty cents a page for documents that used to be free to the public, the Bay Area News Group$ reports. The court system cited state budget cutbacks for prompting the new pricing plan, but many nonprofit groups say they can’t afford the costly charges. 6. And California’s lone wolf, known as OR-7, appears to have found a mate in Southern Oregon and may be raising a family there, the Chron$ reports.